Gazebos and porches are the perfect way to extend the outdoor living area of your Katahdin Cedar Log Home. 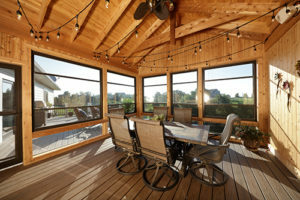 Make your gazebo or porch a three-season room by installing these innovative retractable screen Scenix™ Porch Windows from Larson Manufacturing. Scenix™ combines the fresh air flow from screens with unobstructed, panoramic views. With these porch windows you’ll be able to enjoy insect-free time outdoors without missing any of your beautiful location. Each Scenix™ window is made of two glass panes fitted in separate tracks, with one pane covering the top half of the frame and the other covering the lower half. Slide the glass windows toward the center and the screen unrolls to fill the frame seamlessly from the top and bottom of the opening. 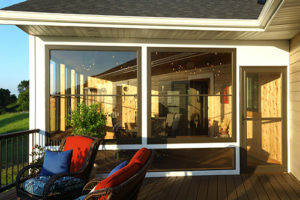 Scenix allows homeowners to customize and control air flow, both top and bottom, while keeping the unobstructed view through tempered 3/16” clear glass. Use the Scenix™ standard sizes in white frames for a cost-saving installation. Standard widths are 44.5 inches, 56.5 inches, and 68.5 inches, in either 72 or 84 inches high. Custom sizes are available for rough opening widths from 24” to 72” and rough heights from 30” to 96”. Custom Scenix™ screen windows can be made from a selection of four colors (white, sandstone, brown and black). Other upgrades include a 4-in-1 finer mesh screen and a choice between gray or bronze tint glass for better privacy and protection from up to 76% of harmful UV rays. Complete your screen porch project with a matching Easy Vent® screen door. They even have a convenient pet door option! We spoke with Larson’s Director of Business Development, Bruce Thomas, about how the Scenix™ works in his home in South Dakota. Even in blustery March, Thomas was able to sit out on his three-season porch fitted with Scenix screen windows. “We really enjoy the ability to use the warmth from solar gain through the windows to dream a little bit about warmer weather,” he said. One installation of Scenix™ noted on the website allows homeowners to m aximize their home’s vistas. 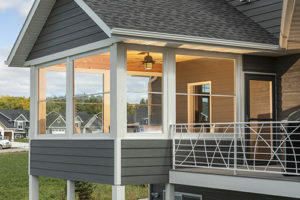 This porch is fitted with Scenix™ porch screen windows over smaller fixed pane glass between the screen and the deck. This creates a wall of windows to bring your beautiful surroundings within sight from the porch or gazebo. Be sure to alert your dealer and design team about plans to include Scenix™ porch windows in your Katahdin Cedar Log Home!